This week I spoke at the ClickConnect 2012 conference. While attending I listened to the product guys/gals at ClickSoftware discuss their mobile application development platform called ClickMobile Touch which is a development platform for HTML5 based enterprise mobility apps. 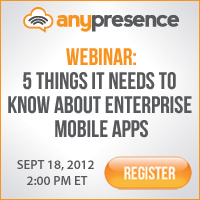 While some may question the value of HTML5 for the enterprise, ClickSoftware is not one of them.